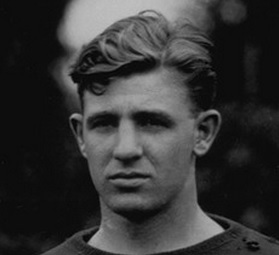 Ralph “Moon” Baker was a football and basketball star at Northwestern University. Baker ended his college career prematurely during his senior year when, while home for the holidays, he a played a game with the Rockford Burrs, an independent professional team. In late January, he signed with the Chicago Bruins of the American Basketball League. Ralph Baker Born: Jun 28, 1902 Died: Aug 3, 1977 Hometown: Rockford, Ill.